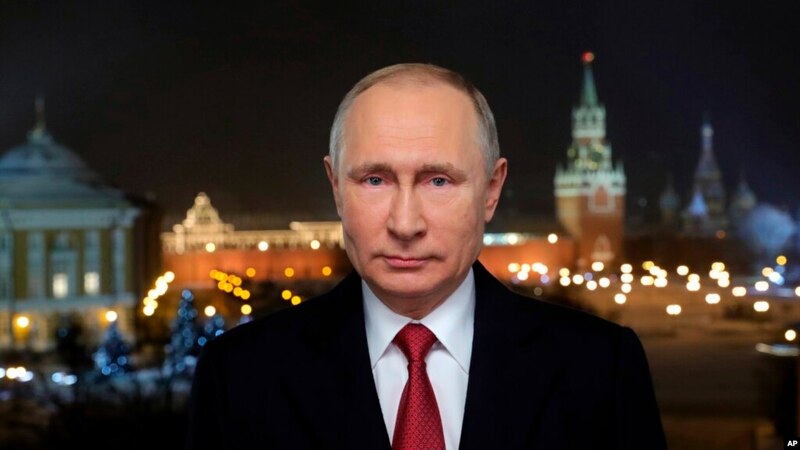 In this photo released by Kremlin Press service via Sputnik agency, Russian President Vladimir Putin speaks during a recording of his annual televised New Year’s message in the Kremlin in Moscow, Jan. 31, 2018. Ukrainian officials are warning that Russia may be about to escalate its conflict with Ukraine, including possibly launching a breakout offensive from Crimea. And they accuse Moscow-backed separatists in Ukraine’s Donbas region of violating the latest cease-fire — dubbed a “New Year’s Truce”— by attacking Ukrainian positions with a heavy-caliber weapon banned under the Minsk peace agreements. 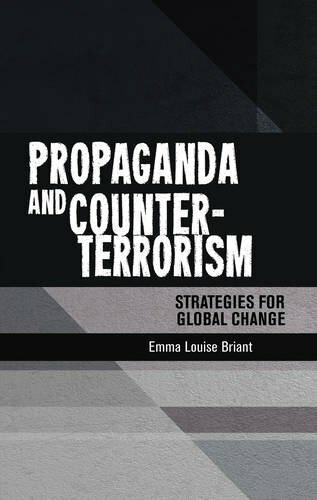 An increasing number of Russian military convoys have been spotted moving toward the border between Crimea, the peninsula annexed by Moscow in 2014, and Ukrainian-held territory, and there have been ominous fighter-jet redeployments to Crimean airfields, according to the Institute for the Study of War, a Washington-based think tank. “Russia continues to build up and prepare its military forces for possible offensive operations against Ukraine from the Crimean peninsula and the East,” the institute has reported. It says Russia could conduct such operations on short notice. Analysts say the movements are threatening, but they are divided over the intent, with some suggesting President Vladimir Putin is keeping the West guessing. “The data suggests that Putin is preparing to attack, although alternative interpretations are possible,” the institute said. “The unpredictability is the point,” a senior European defense official told VOA. “Putin is testing Ukraine and the West to see if he’ll be checked, to see what he can get away with, and maybe with an eye to securing another summit early this year with [U.S. President] Donald Trump,” he added. FILE – Damage on one of three Ukrainian ships is seen after it had been seized, Nov. 25, 2018, in Kerch, Crimea. 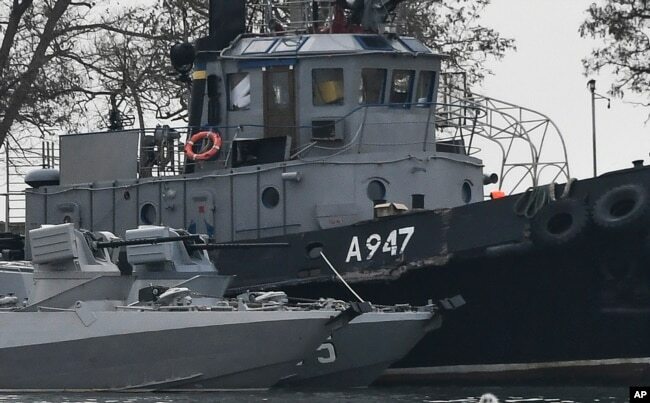 With tensions running high between Ukraine and Russia after Russian coastal forces seized three Ukrainian vessels on Nov. 25 — a tugboat and two patrol boats — in international waters in the Black Sea near Ukraine’s Russian-occupied Crimea peninsula, fears are mounting in Kyiv of another major confrontation. The press service of the Joint Forces Operation, the military command structure overseeing Ukraine’s defense against the Russian-led military intervention in eastern Ukraine, said Ukrainian positions near Novotashkivsk were struck by 120 millimeter mortar rounds Monday night. Weapons with calibers of more than 100mm are banned under the 2015 Minsk II agreement from a 50-kilometer zone running along the front line between Ukrainian and Russian-led forces in Luhansk and Donetsk oblasts. 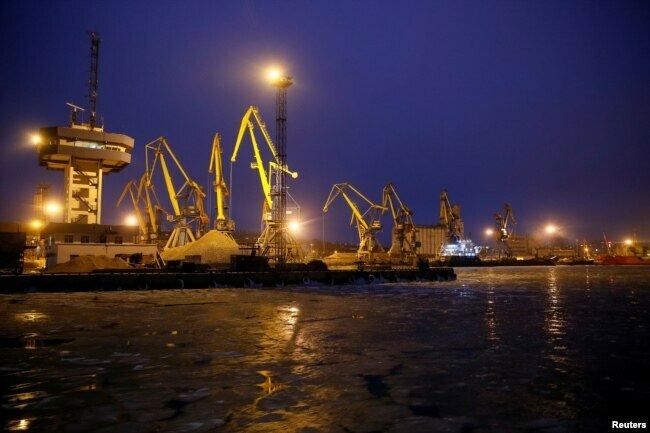 FILE – Cranes are seen in the Azov Sea port of Mariupol, Ukraine, Dec. 2, 2018. Russian-led forces shelled Ukrainian positions also near the port city of Mariupol with 82mm mortars, the press service said. A former adviser to Putin, Andrey Illarionov, now one of the Russian leader’s most strident critics, warned last month that Moscow is ready to deploy special forces to seize a vital Communist-era canal that used to provide 85 percent of Crimea’s fresh water before Ukraine blocked it in 2014. He says the peninsula will face a severe water shortage in the summer, impacting farms and factories, as well as households. 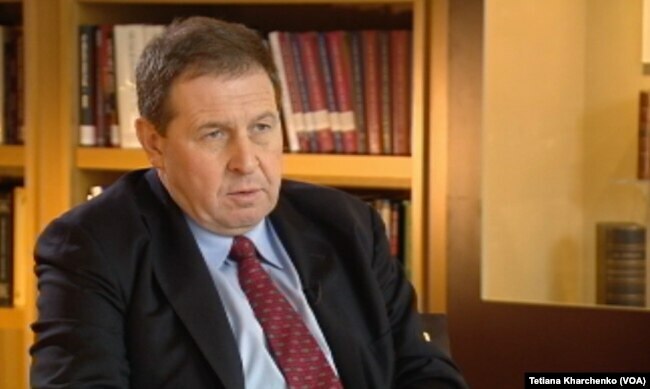 llarionov told the Kyiv Post he believes the West has inadvertently given Moscow the green light for further adventurism by failing to sanction Russia for the November incident in the Azov Sea when Russian coastal forces rammed, fired upon and seized three small Ukrainian vessels. In recent weeks, Russian news outlets have published articles about water shortages on the Crimean peninsula, as well as about Russian military exercises taking place near the narrow land corridor linking Crimea to Ukraine’s Kherson region. FILE – Ukrainian servicemen stand guard at a checkpoint near the town of Armyansk in Kherson region adjacent to Crimea, March 23, 2014. Some analysts suggest that Putin might cast any seizing of the canal as an intervention necessitated to prevent a Ukraine-provoked humanitarian crisis on the peninsula. 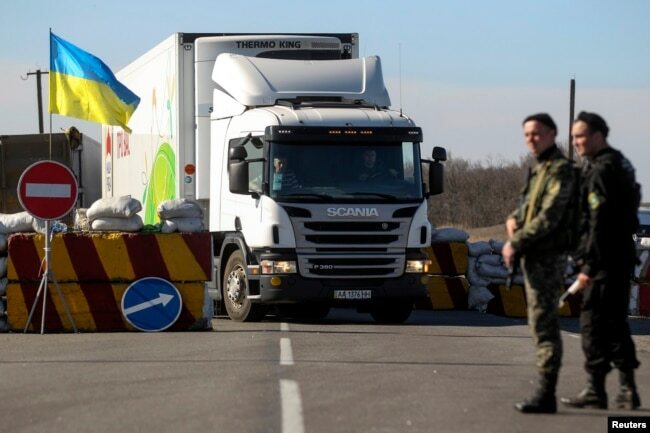 An occupation of parts of the Kherson region would give Russian forces the ability to tighten their stranglehold on Ukraine’s ports and to interfere with ship movements in and out of Mykolaiv and Mariupol, which are already experiencing sharp decreases in freight traffic. Among the Russian military movements being observed by Kyiv and Western powers are the redeployments of fighter jets. Just before Christmas, Reuters reported more than a dozen Su-27 and Su-30 fighter jets were relocated to Belbek Airbase near Sevastopol from Krymsk airfield in Krasnodar Territory. 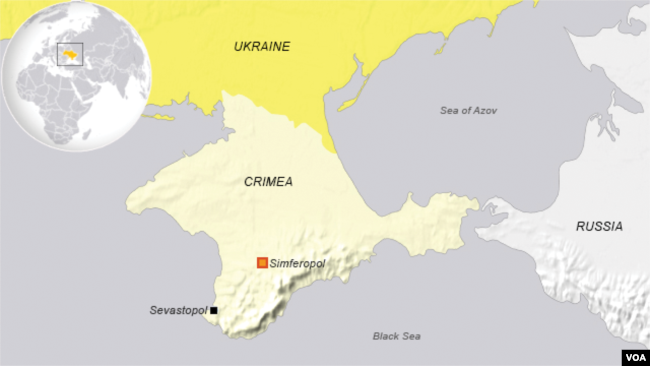 “The next phase will probably be land and sea operations that would eventually secure maybe even Mariupol but continue to take the Ukrainian coastline and connect Crimea back up to Russia along the Sea of Azov,” Hodges said. “It’s not going to happen in the next six months, but this is the direction they’re taking until they completely own the Black Sea and they’ve isolated Ukraine,” he added.